That's a traditional German recipe for Apflemus the way it was made at our home since generations. Take a big amount of apples. Clean them, cut the inner out, add some water and cook them covered in an enormous pot until they're really crushed. Purée the apples with a food mill. 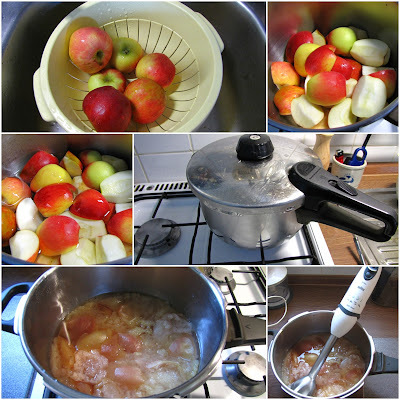 If you like, add now as much sugar as sweet you want your Apfelmus. If not, skip this step and add the sugar after you open a jar to serve it. Put the purée into cleaned preserving jars and pasteurise it for about 20 minutes in a preserving pot. Keep it cool in a dark place. You can use Apfelmus as compote or a sauce for potato pancake or as a topping for a cake.